Its release price today is £630; a 16% euro increase on last year, which represents value when compared to other great vintages. The 94 and 95 point scoring 2009 and 2010 both trade at £680 per case of 12, while the 92+ scoring 2005 trades at £750. Like Beychevelle we expect Brane Cantenac to achieve the highest score within its range and £52.50 per bottle for a 98 point scoring Second Growth is unexpected value indeed. 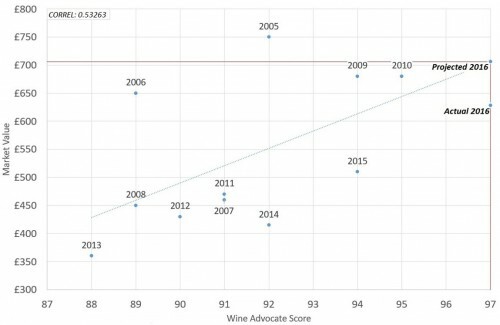 As displayed by the graph, the median Wine Advocate score of 97 points would chart with an indicative release price of approximately £710. As such £630 per case of 12 bottles is a strong buy indeed, which results in a Price Over Points Score of 37, a superb proposition. This will be a sell-out wine and one of the most prized assets of the 2016 campaign: one of the wines of the vintage! The 2016 release of Brane Cantenac is a special combination – the rare mix of a vintage outscoring its predecessors but releasing at a price below the historic trendline. The release price of £630 is around an £80 discount to the projections of a 97 (median) point scoring Brane Cantenac and could be expected for a release scoring between 94 and 95. 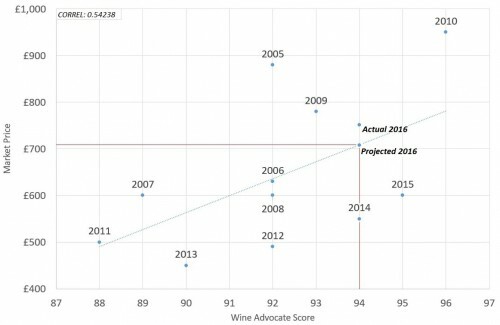 This demonstrates a strong incentive to buy on release which will be elevated further should the 2016 vintage achieve 98 points – the upper end of its banded score. Chateau Brane Cantenac was founded in the 18th Century by the Gorce family. At the time it was one of the most expensive wines in Bordeaux, the same price as Chateau Mouton Rothschild’s contemporary incarnation. In fact, The Baron of Brane, known as the “Napoleon of the Vineyards” purchased Brane Canteanc in 1833, selling what was to become Mouton Rothschild in order to do so. It was then classified as a Second Growth in 1855. Today, it is owned by the Lurton family, run by Henri Lurton, who has replanted large swathes of vineyards and overhauled the winemaking procedure since taking over in 1992. Around 11,000 cases are made every year. One of our favourite wines, Leoville Barton has also released. In 2016 the great weather conditions in St Julien has resulted in a superb Leoville Barton which has been awarded 93-95 points from the Wine Advocate and 95-96 from James Suckling. Neal Martin states ‘Maybe it’s not quite up there with the stellar 2015 Léoville Barton, which I re-tasted at the time, but it is not far off.’ In response to this the Estate has released at a 18% euro increase, which translates as a 25% increase to the current trading price of the superior 2015. We therefore posit that the 2016 has been priced optimistically. When comparing the market value of past vintages with their score from The Wine Advocate, a release price of £750 would indicate a score in excess of 95 points. The 2016 vintage has been awarded a median score of 94 points – this should be indicative of a release price of approximately £710. Both the 2014 and 2015 vintages are scored either equal or better to the 2016 and fall below both today’s release and the trendline. This highlights the relative value that can be found from these two releases and the over exuberance of the pricing in 2016. That said, Leoville Barton represents the archetype of great Bordeaux, each vintage is built to last, an idiom for truly great, age-worthy Bordeaux. If it is one of your perennials, it won’t disappoint, it is a superb Leoville Barton even if it lacks immediate relative vintage value on release. Chateau Leoville was at the time of the French Revolution the largest Estate in the Medoc, however, it was confiscated when the Marquis de Las Cases fled the Revolution. Today it occupies a quarter of the original Estate. In 1826 Hugh Barton, of successful negociant business Barton & Guestier bought a share in the Estate with the purpose of returning it to its original owner. The Marquis de Las Cases, unfortunately, was unable to reimburse M. Barton for the land and so he remained the owner. Interestingly five years before, Hugh Barton had also acquired the neighbouring property of Langoa and as there was no chai on the Leoville land he was forced to vinify both the wines of Leoville and Langoa at the chai on the Langoa Estate. This practice continues to this day. Especially in recent years, Leoville Barton has a reputation of producing wonderful wines at reasonable prices and coupled with the wit and charm of Anthony Barton this is a favourite of consumers and journalists alike. The 2016 Leoville-Barton is a blend of 86% Cabernet Sauvignon and 14% Merlot picked from 29 September until 13 October, matured in 60% new oak and delivering 13% alcohol. It has a more intense bouquet compared to the Langoa-Barton, plenty of intense blackberry and raspberry fruit, minerals, cedar and a hint of licorice. The palate is a little chewy on the entry with good grip in the mouth. This demonstrates the backbone of the finish, just the right amount of spiciness with excellent salinity on the long finish. It is not a once-in-a-lifetime Leoville Barton, but (as usual) it just seems to do everything right. Maybe it’s not quite up there with the stellar 2015 Léoville Barton, which I re-tasted at the time, but it is not far off.